UPDATED: Magnus Carlsen was facing his toughest challenge yet as he headed into the World Chess Championship that started up in London on Friday. 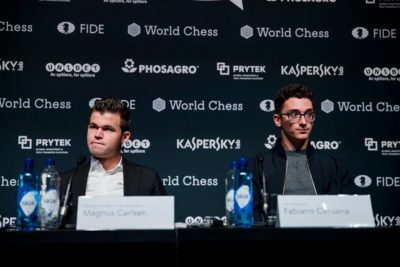 At the end of weekend action, the score was 1-1, while many think Norway’s reigning world champion has met his proverbial match in challenger Fabiano Caruana. Several other Norwegian chess experts think Carlsen will prevail, but all agree that his challenger known as “Fabi” is the toughest yet. While Carlsen retains his number-one world ranking, Caruana is only a few points behind him. State broadcaster NRK’s chess commentator Torstein Bae noted that Caruana has been regarded as the best player in the world for the past six months. He even won Norway Chess earlier this year, in which Carlsen also played but didn’t do well. “As of today, Magnus isn’t objectively better than Caruana, probably to the contrary,” said Atle Green, an international master in chess and columnist in Aftenposten. Green was predicting a close race between the two, with a score of 6-6 “that Magnus will win” in additional play. The first of the two to win 6.5 points or more wins the championship. Carlsen himself, and the people around him who include his ever-present father Henrik, have settled into a nearby five-star hotel for the duration of the championships, not least because it’s just a short walk from The College at Holborn where play takes place. “The traffic in London is unpredictable, so we didn’t want to have to depend on driving from the hotel,” Espen Agdestein told Aftenposten. Carlsen’s multi-million-kroner income means he and his entourage can afford comfort. 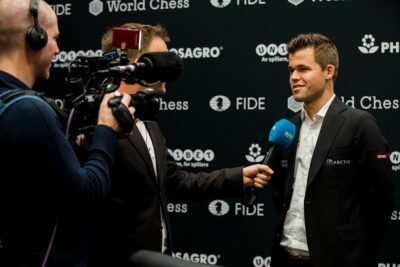 Agdestein also stressed the need simply for a good night’s sleep: “The hotel is set back from the street,” he said, which can give Team Carlsen some peace and quiet. “It’s very important to have good energy and feel good,” Agdestein said. Carlsen has also had his own chef serving up Norwegian food during previous tournaments, and everyone will be doing their best to keep him happy and healthy. He was in good spirits at the opening press conference in London on Thursday, joking that he had no “female support” because “women detest me, I repell them.” That brought laughs desite doubts about the authenticity of the remark. His sisters, at least, have also provided plenty of support over the years. Carlsen told NRK that he’s been “a bit sick” lately but has felt good the past few week. “I hope I’ve just managed to get into shape,” he said. He father Henrik confirmed his son had a cold in early October that hung on for a few weeks. “He should be healthy now,” he said. Play got underway late Friday afternoon, and is due to run through November 28.